I’m very conscious of the fact that I describe this blog as helping people set up a marquee hire business but for most visitors it’s like coming along half way through a conversation -most articles are written assuming you’re already in business. So what I plan to do is to write a guide on what I’d do if I was starting up a marquee hire business now, maybe split in to two angles – full-time or part-time start ups. I’ll try to post the guide in a step by step process here then at the end I’ll put it together in a down-loadable guide. Merry Xmas & Happy New Year to all of our customers, thank you for your business and I hope we can continue helping you to be successful in 2010. Here is an example. 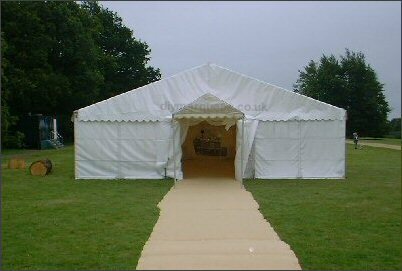 When booking yellow pages advertising I would book it under the name AAAAAAAAAAAAAAAAAAAAAADIY Marquees. This would then appear as the first marquee company in yellow pages. To book it you just need a letterhead with your new name on (easily done on Word) -the A’s don’t need to be as large or obvious as my ones, it’s just an example. If you want to see good examples of this in practice look at a really competitive listing like plumbing – the a’s go all round their adverts! This isn’t necessary for yell.com as they choose their listings to appear randomly. i. You get wet. Go back a few weeks and read my post about buying good waterproofs! You know that tan that’s just fading away? Well this is the down side of working outdoors! ii. Waterlogging. This is a serious problem, some peoples gardens and patios will hold surface water and you’ve got to put a marquee up on them. If it’s just soft underfoot then the usual groundsheet under matting/carpet is okay, if there’s water sitting on top of the surface then you have to consider raising that surface somehow – usually by building a wooden floor underneath using plywood with battens on the back. You can be imaginative in putting sandbags round the outside or something but really a raised wooden floor is the only sure-fire way. iii. ‘pooling’ of water on the marquee roof. This can happen to any marquee in severe wind and rain but needs resolving swiftly to avoid damage (just push the water out). You can help prevent it by making the sure the roof is tight -use your best bungees on the roof and when you assemble the metalwork don’t have the roof poles fully in to the sockets when you tighten the bolts, this makes the roof a few inches wider and stretches out the fabric. 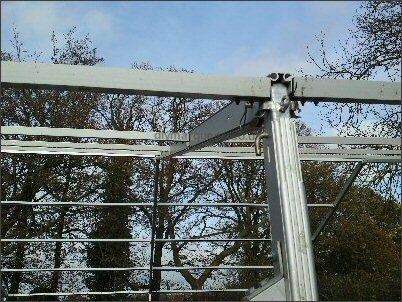 If pooling occurs regularly think about attaching a tight rope from the middle purlin out to the eaves purlin to help stop it. 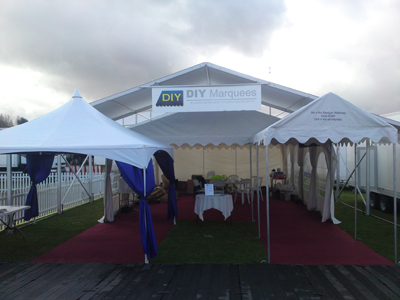 9m wide modular marquees for sale – New for 2010! If you visited us at the Showmans Show you will know that we’re going to be supplying 9m wide modular marquees from March/April of next year. Why is this so exciting? Why are we doing it? Why should you buy ours? It’s exciting because it’s the culmination of a LOT of work and we’re confident it’s going to be well received. 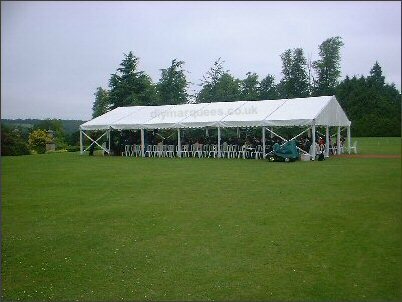 We’re doing it because a lot of our customers are successful and expanding, at some time most expanding marquee hire companies have to offer larger structures so the sensible next step is 9m wide.  Why should you buy from us? Well we’ve worked very hard to ensure our marquees are compatible with the majority of kit already out there in the UK as well as making sure it’s the high quality and value for money people have come to expect from us. We are taking pre-orders now for delivery in March/April 2010, if you don’t order by mid-December then we can’t guarantee availability. Prices are available by request (or look at your Showmans Show price list). 4-channel aluminium profile with steel knuckles & apexes. The 4-channel aluminium allows greater flexibility with things like porches (see photo below) and catering areas. Translucent PVC used for both walls and roofs – a lot of cheap modular marquees around the world use a ‘blackout’ layer in their roof PVC making the interior grey and gloomy (think of the light in an old canvas marquee). This might be suitable for deserts or the south of France but in the UK if it’s light outside you want it to be light inside. I think they may use the blackout layer just to increase the gsm of the fabric, certainly most of the PVC roofs already in use don’t use blackout. 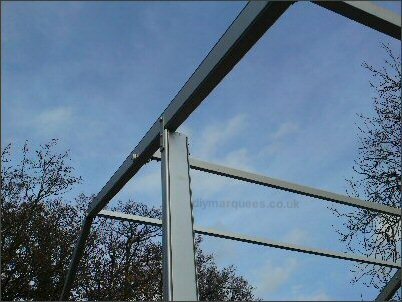 2.3m eaves – if you’re buying a modular marquee for use in the UK you want it to have 2.3m eaves. Why? 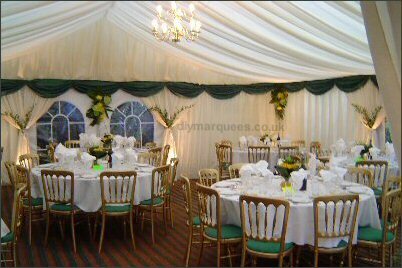 Well nearly all the existing stock used in UK marquee hire companies uses 2.3m eaves, this means that all lining suppliers and theming companies have stock based on a 2.3m eave -so you can only use them if you’ve got the correct kit. Using 2.3m eaves also means the resale value of the marquee will be higher and you’re not tied to us if you want to buy more framework in the future. A training session – when your marquee’s ready we’ll be arranging several training sessions for you to come along to so we can pass on all of our knowledge and tips (surprisingly that’s quite a lot!). We put these marquees up for 10 years and there’s lots of things to make your life easier. A free single page website optimised for whatever keyphrase you want. A lot of companies have these single page satellites designed to get up the search rankings that link through to your main site. They can take a while to get there but we’re quite good at it and we’ll design one for you. 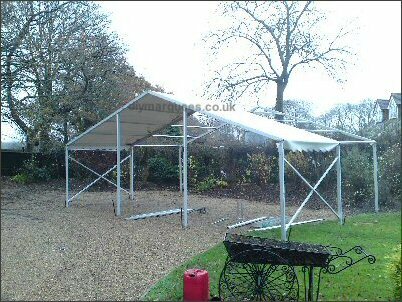 Posted in commercial marquees, marquee hire advice, marquee sales, marquees for sale, websites | Comments Off on 9m wide modular marquees for sale – New for 2010! I’m not really one for marketing lingo but everyone should know their USP -Unique Selling Point. It will probably change as you grow, expand and find your market but you should have an idea of what it is right now. The cheapest. 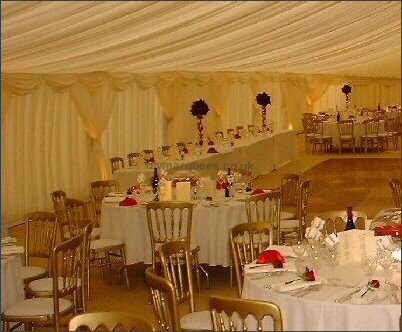 When you start a marquee hire business you should be among the cheapest in the area. Wedding specialists. We had done a LOT of weddings by the end but always tried to make sure each customer felt special and individual. We’d offer them advice and choices even though 90% of people ended up having the same thing! Reliable and trustworthy – this is just something you build up over a long time by reputation. It can swiftly be lost which is why I was careful who we sold it to and made sure they’d carry on in the same vein. 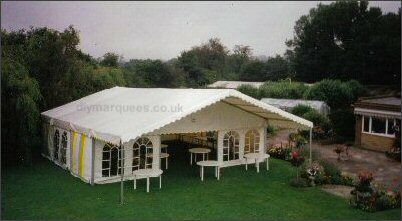 So if you’re thinking of starting up a marquee hire venture then play on the ‘new stock’ and ‘cheapest’ angles to get you business. If you’re an established company make sure you know your USP and where you’re currently at. If you don’t know then take time out and think about it, if you’re confused about what your angle is then how do you think customers are going to feel? PS -advance warning, next week’s post will be all about our 9m wide kit as the pre-order deadline is coming up soon. Most marquee hirer’s will let someone else look after their website, our speciality is putting up marquees not web design after all. But whoever you are you should still be using google and making it work for you. By using google I don’t mean using their search engine, I mean using their extra tools. You have to register and set it up but it doesn’t take long. Google’s local business center: when it looks like you’re searching for a local business, the first few results appear on a map – these are results from google’s local business center. Registering for this is a MUST. Webmaster tools: This helps you find out if there’s any problems with your marquee website. If the person who looks after your website is on the ball you don’t need this. For those of us who look after our own websites it’s very handy. Adwords: You know the ads that appear on the right hand side (and sometimes above) the normal search results? They’re paid-for ads, that’s how google makes money. In my experience they’re very useful and well worth the small amount of money required, -note when you first start out have a good search round as often there’s vouchers out there for free £20/£30 for adwords. Google analytics: With adwords comes another incredibly useful program called analytics, by installing a small piece of code on to your website you can keep track of number of visitors, where they go, what they searched for to find your site and 101 other things. If you’re technically minded and/or do your own website this is incredibly useful. Google alerts: you put a search term in and every time google finds something new with that search term it’ll email you (once a day,week or month). How is this of use? Well if you put your name in here you can keep track of anyone online anywhere who mentions you. 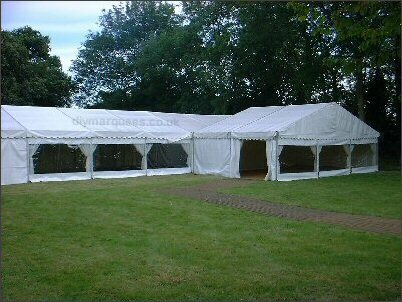 If you put “marquee hire” and your local area then you’ll keep track of who else is around you. This is not to be underestimated, it’s very very useful. There’s other tools on there but these are the main ones that I think most people would be interested in who run marquee hire businesses.